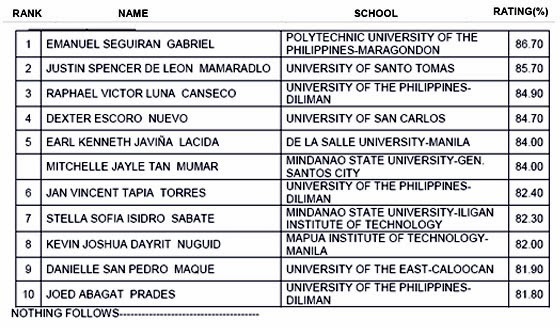 List of passers, top 10 for March 2014 Electronics Engineer (ECE) Licensure Exam - Balita Boss! The Professional Regulation Commission (PRC) announced Friday, March 7 that 907 out of 2574 passed the Electronics Engineer (ECE) Licensure Examination administered by the Board of Electronics Engineering in the cities of Manila, Baguio, Davao, and Lucena. Electronics Engineer is someone who is responsible on the design and use of electronic apparatuses to develop applications in communication, control and computing. ECE Licensure exam was conducted last March 2 and 3, 2014. Polytechnic University of the Philippines (Maragondon) graduate Emanuel S. Gabriel topped the Electronics Engineer Board Exam with a passing rate of 86.70%. The top performing school for ECE board exams is University of the Philippines – Diliman for having 100% passing percentage. View or download the performance of school in the March 2014 ECE Licensure Examinations at prc.gov.ph. The date and venue for the oathtaking ceremony of the new successful examinees in the Electronics Engineer (ECE) Licensure Examination WILL BE ANNOUNCED LATER, PRC said.